Larb (ลาบ) is sort of like the meat sibling of som tam; They are made from different ingredients, but go incredibly well together. It’s a staple dish of Thai Isaan food, it’s easy to make, and it’s a brilliant combination of ingredients. A spoon of larb (ลาบ) followed by a ball of fresh sticky rice, is one of the great flavor combinations. 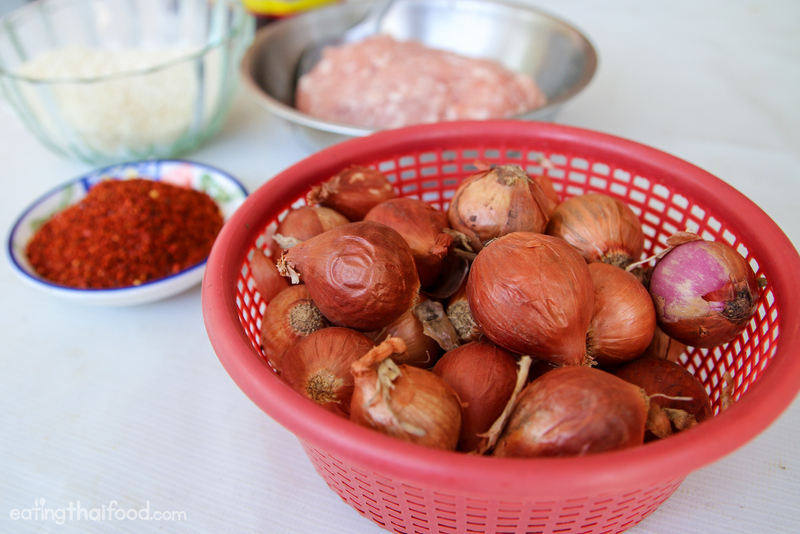 In this blog post, you’ll find an authentic version of larb, like you find in Thailand. Larb (ลาบ) is a Thai salad, but it’s not a vegetable salad, instead it’s a meat salad. The minced pork is wonderfully seasoned with fish sauce, chili flakes, lime juice, toasted sticky rice to give it some crunchy texture, and a wonderful assortment of fresh herbs to bring it all together. If you’ve eaten larb (ลาบ), I’m sure you love it, but if you’ve never tried it, you’re in for a real treat! 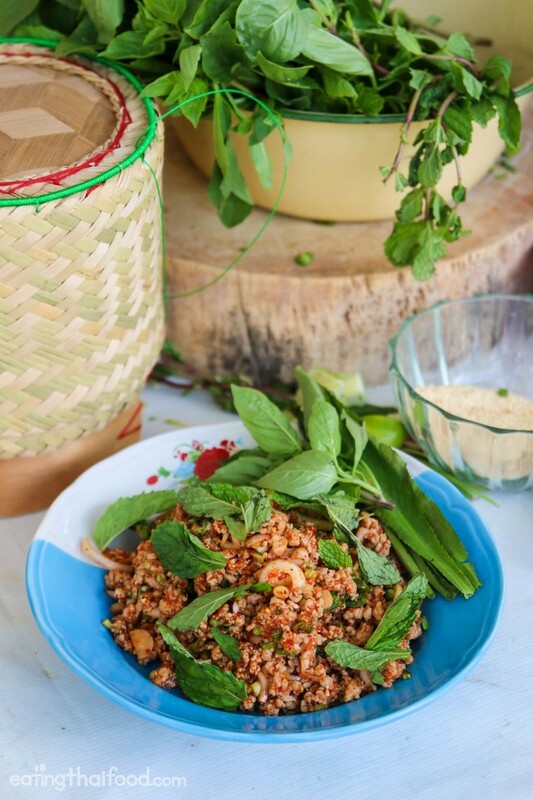 One of the most essential ingredients in any Thai larb recipe is something known as khao kua (ข้าวคั่ว), or toasted sticky rice. It’s a really important part of Thai larb as it gives the pork a crunchy bite and a roasted fragrance. The good news is, you should be able to purchase Thai sticky rice at most Asian supermarkets, and then it’s pretty easy to toast the rice and make it yourself. You basically just throw the white sticky rice into a medium-low heated pan or wok, and toast it, dry without any oil. Continually mix it so it doesn’t burn. The rice will start to turn yellow and then turn kind of golden brown. It will also start smelling really good, almost like popcorn. It took me about 15 minutes or so to get that nice brown color on the sticky rice. From there, you either need to put the sticky rice in a food processor and grind it into a coarse powder, or bust out your mortar and pestle (this is the way I did it) and pound it. Then you set the khao kua aside until you mix the larb salad together. Now when it comes to Thai street food Thai larb is most frequently made with minced pork (larb moo ลาบหมู). So I decided to make the this Thai larb recipe with minced pork as well, but it’s also very commonly found with minced chicken or minced duck (and minced beef would be tasty too). You can even make it with fish, or tofu, or mushrooms – all great choices. Anyway, the basic seasoning of Thai larb works well with just about any protein you want to substitute. 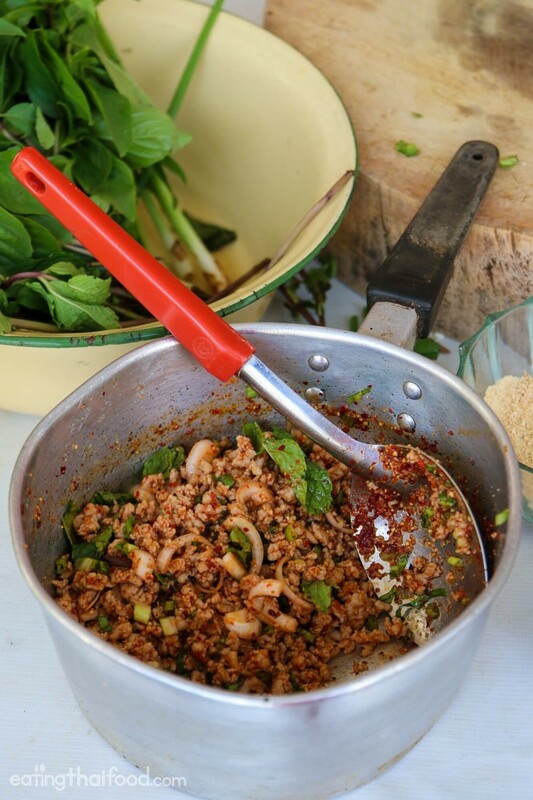 Thai larb rarely uses fresh chilies, and instead uses dry ground chili flakes, known as prik bon, to give it some color and heat. Thai shallots are small about the size of a big grape, but they pack quite a punch – they are very flavorful. I’ve seen some shallots in other places that look like the size of small lemons, but I don’t think they are quite as pungent as the Thai ones. Anyway, just use your judgement, you could even substitute a strong red onion for the shallots. Mix the larb right in a pot! As a final tip, the easiest way to make larb, and the way they commonly prepare it on the streets of Thailand, is by cooking the pork in a small saucepan or pot, taking it off the heat, and then mixing in all the other ingredients right into the pot. Recipe size: This recipe makes one good sized plate / bowl full of larb. So depending on how many dishes you have for a meal, it could be big enough for 1 – 2 people, or shared between 3 – 4 people (if you have a full spread of Thai dishes). Eat it with: Larb is a Thai Isaan dish, normally eaten along with a side of Thai green papaya salad (som tam) and a plate of steamed Thai sticky rice. Like I mention in all my Thai recipes, Thai food is very much a taste-test based cuisine. So please use the ingredients listed in this larb recipe as a guide, but not as exact instruction. You need to taste test to make sure your larb is balanced the way you like it – with the fish sauce, lime juice, chilies, etc. Thai larb made with minced pork (larb moo ลาบหมู) is one of the most popular Thai streets foods in Isaan cuisine. It's a wonderful combination of minced pork, lime juice, chili flakes, fish sauce, and herbs to give it a refreshing touch. First step is to make the toasted rice (khao kua ข้าวคั่ว). 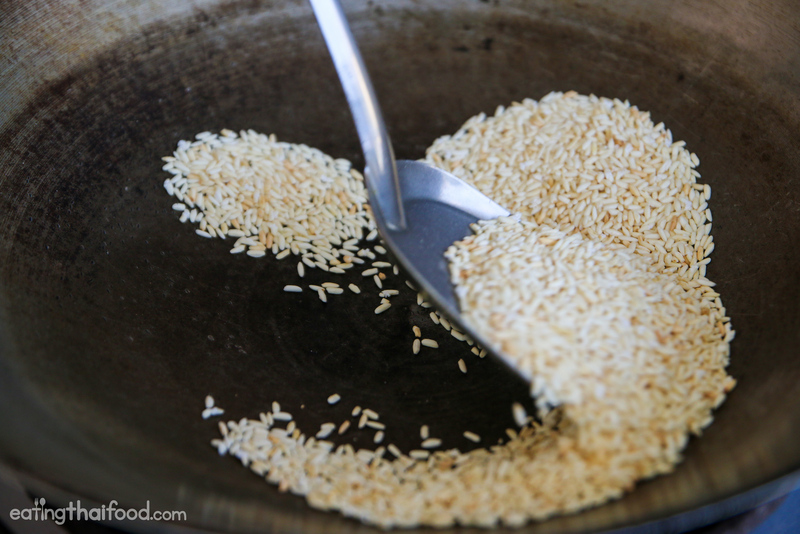 Heat a frying pan on low heat, toss in the uncooked Thai sticky rice (no oil). Stir continuously, kind of like you’re roasting peanuts or coffee. 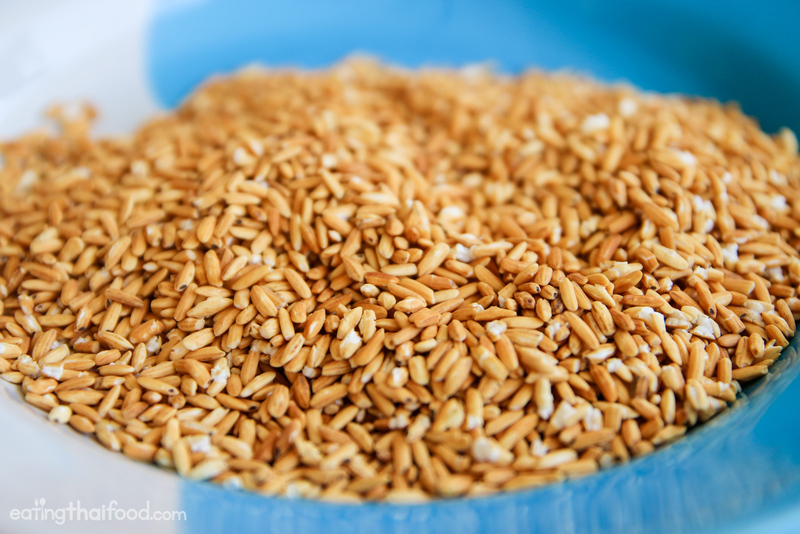 Toast the rice until it turns from white to golden yellow, almost to the point where it looks like brown wheat. It will also be very fragrant and smell almost like popcorn. It took me about 15 minutes or so. Once the rice is finished toasting, and has cooled off a bit, put it into your stone mortar and pestle. Pound the rice until it turns into a coarse powder (a blender or food processor will also work fine). Put your toasted sticky rice powder in a bowl aside. Add 300 grams of minced pork to a small sized saucepan with a handle. Fry the pork, breaking it into small minced pieces, until it’s fully cooked all the way through. For best flavor, leave all the oils that come out (but if you want to be healthier, you can also drain the pork oil, and add in a splash of water instead). Take the pork off the heat. Leaving the pork in the same pot, add 1 heaping tablespoon of the toasted rice powder into the pork. 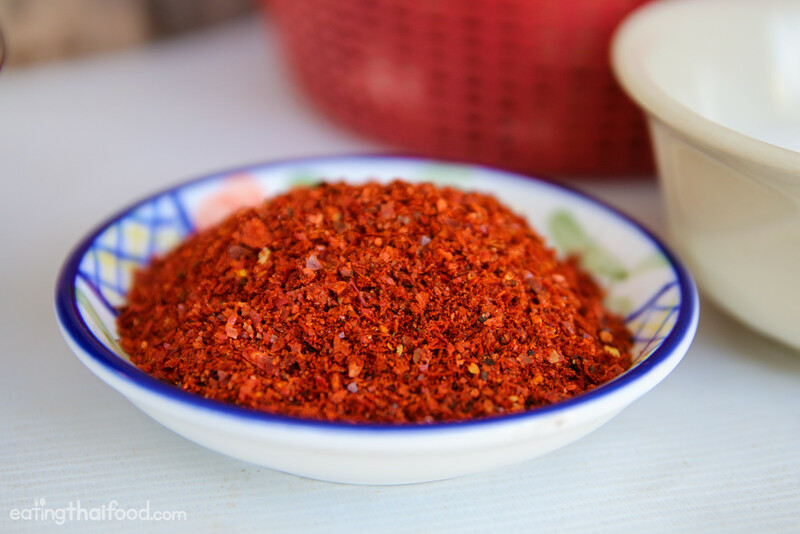 Also toss in ½ - 1 tablespoon of chili flakes. Add a pinch of sugar, ½ tablespoon of fish sauce, and squeeze in the juice from 1 - 2 limes (I used about 1 ½ full limes, but I like it quite sour). Give the pork and the seasoning a quick stir. Peel and slice the shallots, finely mince about 5 green onions and a few culantro leaves (if you have them), and just pluck about 20 or so mint leaves off the stem. Throw everything into the saucepan with the pork. 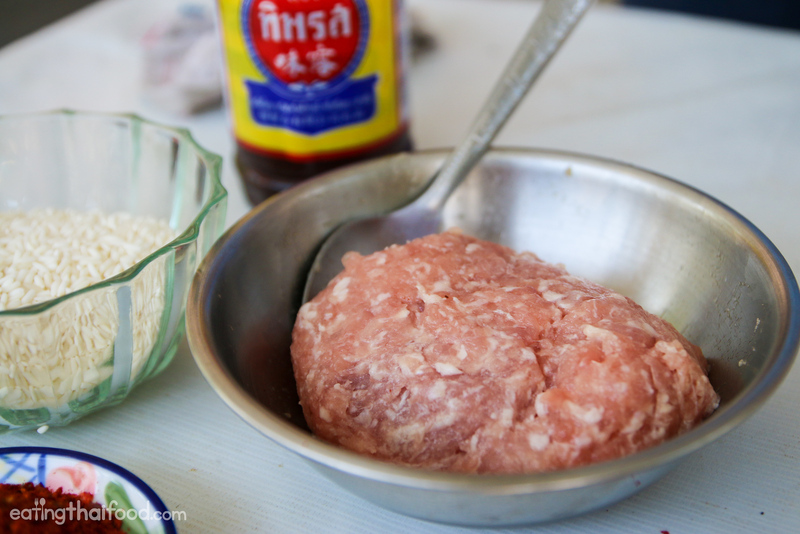 Give the larb moo a good mix, making sure all the spices and dressing coats the pork. Taste test. See if it needs more fish sauce for saltiness, lime juice, or chili flakes. Get it the way you want it. 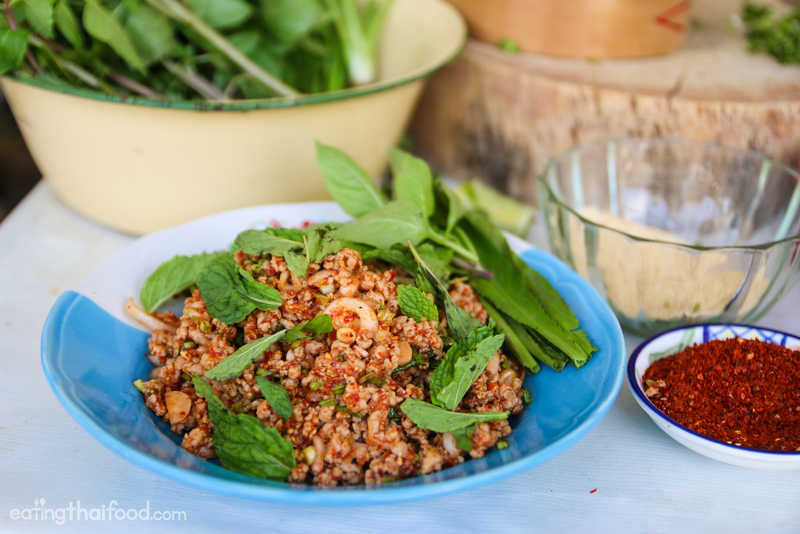 Dish it out onto a plate and garnish with more mint leaves, Thai sweet basil, and culantro. In Thailand, larb moo (ลาบหมู) is normally eaten along with a plate of Thai sticky rice and accompanied by a plate of som tam (green papaya salad ส้มตำ). Get the full Thai larb recipe here, and also be sure to check out all of my authentic Thai recipes. As long as you get all the ingredients together, this Thai larb recipe (larb moo ลาบหมู) is quite simple to make, and it tastes absolutely amazing. Let me know what you think in the comments below. Happy cooking! 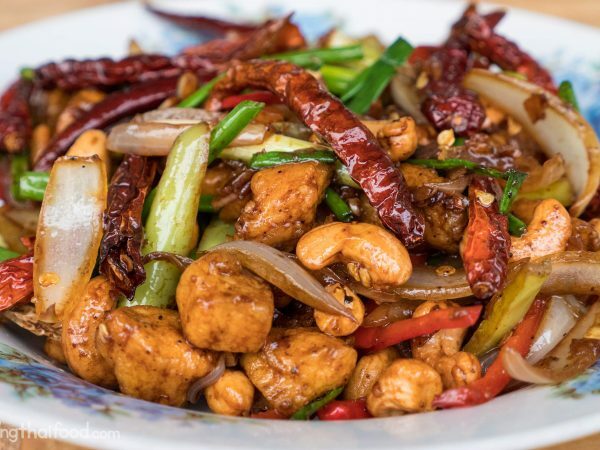 Amazing Thai Cashew Chicken Recipe – Authentic and Easy to Make! 178 comments. I'd love to hear from you! I love these recipes!!! They’re soooo delicious and yummy!!! Can’t get enough of these flavors!!!!! They are my favorite thai dishes. Not nearly, and I mean nearly as hot as my first experience with laab that I had in Sakeo, Thailand in 1980. Does the rice flour get cooked or is it ground small enough that it doesn’t need to be cooked? Would sushi rice work if I can’t find thai sticky rice? 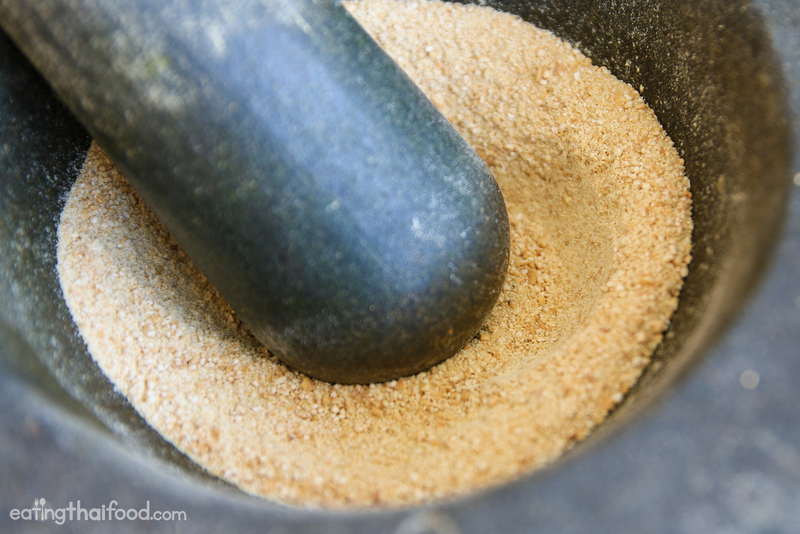 will a wooden pestle and mortar work? Tastes just like my mom’s! Completely disagree, this is not the classic way and for me makes the larb taste wierd. Fresh chilli doesn’t go in Larb, always dried. I don’t know about your fish sauce but if I would put more than a few drops of my fish sauce in it, you would not be able to eat it – first of all it would be way too salty and you would taste only fish. I made this dish last weekend, it is just mindblowingly tasty! I used minced pork, the texture and taste of it is just perfect, but I am going to try other types of meat as well. I’ve loved making this dish for years, and this was an OK recipe. Unavailable to ground chicken, I used 99% fat-free ground turkey breast, and I believe it added a bit of depth, though made it drier. And I added a squirt of rice vinegar for a bit more acidity, and slivers of lime peel. Because the turkey’s so low in fat, it tends to clump up while cooking. Low and slow, turning and breaking up often. It didn’t have the punch we were looking for, but a squirt of sriracha gave it just right added heat and flavor. I couldn’t find Thai sticky rice, so we had to suffer with long grain white for the flour and the side, with just a bare drizzle of toasted sesame oil to help offset the dryness of the turkey, and to deepen the flavor profile. Awesome! Great flavors and simple to put together. Just made this in about 15 minutes, and it was authentic, delicious, and so simple. You can grow most of the herbs (and grow/use fresh chile peppers instead of the chili flakes), making it even cheaper and fresher. It’s an absolute crowd pleaser and I’ll definitely cook this again. Thanks! I haven’t made this yet but I will. Great to hear that Siggy, enjoy! You are so AWESOME! I’m so happy I found your blog!!! Your recipes are great and also, you are inspiring my 8-year-old son to cook like you! Thank you so much for that!!! Thanks for posting this recipe. I can’t wait to make your version of it. I’m curious- in the US it’s not easy to find minced chicken. Do you have any suggestions on how to mince rapidly? Would I use a food processor? I made this with 99% fat-free turkey breast. It’s as bland as chicken breast, but you really have to pay attention to the turkey; it tends to clump. Keep turning and breaking it up, and it enjoys the flavors every bit as much as chicken. Thank you so much for building this wonderful site! I’ve been traveling to Thailand for twenty years, and this is hands down my favorite dish… And this recipe is hands down the best, most authentic version I’ve found. We’re so grateful you posted this! We make 4x servings, because it keeps well and tastes even better the next day. If you multiply the servings, and are using rice powder instead of toasted rice, you need to slightly reduce the total amount or it will be a bit “goopy”. We use a ratio of 3:1 chicken to pork, wth the pork adding moisture (via the fat content), but also because of the boost in flavor. We found culantro at our local Latin grocery, and WOW, what a difference! It’s more citrusy than cilantro when raw, very aromatic, and best of all, i hate cilantro because it tastes like soap to me, but culantro does not. I’m so excited to try it in other dishes that call for cilantro! Finally, we have toasted the rice, and used a mortar to crush it, and i can honestly say there is no substitute… It’s worth the time, but make sure to make a bigger batch… We love to mix it in, but alsi sprinkle extra on after serving. The texture contrast is especially important if you’re serving over rice alone (we put it intro romain lettuce leaves cut in half, and eat it like a taco ????). Note: try boosting the lime juice – this is fantastic when extra sour, and you can serve raw sliced shallots, mint, culantro, and powdered chili as condiments for people to customize… All the ingredients are mellowed by the heat, but raw they add a different dimension. I have lived with different Thai students in London and watched them cook Larb moo and I have never seen them cook this dish with oil, it is always cooked in a minimal amount of water and packs a great flavour without oil. Thank you for your Blog! My sister n law is Thai and she attempted to show me how to make but I learn easier by doing…..this way I can try on my own. Furr (not sure correct spelling) is also a great soup recipe I think everyone would enjoy if you know how to make I’d love to revisit and see how you do. You are very welcome Tika! Yes, most of these recipes are adaptable to a wide variety of diets, not only how we might see them made at the shop. Hi, I just wanted to correct you that one pound is approximately 454 grams, not the 300 you have listed. My first attempt at Thai food. Luckily I have access to a large Asian market and was able to get all the ingredients as well as Berkshire pork. Came out perfect as the pork was lean making for a nice dry salad. Throw in some fresh diced chili’s for an extra kick. Great recipe and super easy. This was fantastic! Easy to make and a fresh way to mix up the routine. Thank you! I made this for dinner tonight. It was FANTASTIC! Thanks!! Lovely recipe and authentic in that it has ground roasted rice in it! Thanks ???????? Is there a change that when you find some sweet food spot in Bangkok or where ever, you could “mark” hehehehe it to some map? I just discovered your blog and I LOVE it! Keep it coming!!! I could eat this every day. Seriously. From Belgium and raised with all fresh and homemade food, Flemish, French and some German influences. However, since I lived in San Francisco and traveled all over the world, except Asia, that’s next, I am really interested in mastering the art of any ethnic cooking.. wish I could open a multi cultural restaurant somewhere. Will make your latb gai pork salad today with my own personal touches. Thanks and have a great thai day???????????? Thanks for the great recipe. Subbed in organic ground chicken and added a minced Serrano peeper to dial up the heat. The tosted rice is a great technique. This is going into the rotation on thai nights in my house. Sawadee khrap! Curious, to up the heat why you didn’t just add fresh Thai chili peppers, which are much hotter than the powder? We’re they not available? I’m so excited I found your site. I’m living in Germany with my husband and kids and I miss my Grandma and her cooking back in the states. There’s a Thai restaurant close by that is delicious (but the lady isn’t so nice haha) anyway, thank you for bringing me a bit closer to homega! Mark, I made this tonight. It was sick (that’s a good thing!). Thanks again for another killer recipe. Made a vegetarian version of this with TVP last night and it was a hit! Thanks so much. Just use tofu insread of pork. It will crumble up just like ground meat. The fish sauce is problematic if you are strict, but you can use some vegetabke sources of umamai loke fermented black beans or dried mushrooms or just leave it out. I used cauliflower, that had been minced and sauted until soft but still crunchy. Did precisely the same thing just now. Excellent! Hi great recipe, will distribute. any amazon.com thai brand that is spicy and red like u ised? I tried another Larb Gai recipe last night and was so put off. It was mainly the same recipe but called for 4 tbsp of fish sauce! I only used 2 tbsp but it was extremely salty and overwhelming. I didn’t even like the aroma while it was cooking! I decided this morning to see if I could come up with a different recipe because I liked the concept of Larb Gai. I was so happy to see in this recipe only a 1/2 tbsp of fish sauce, which to me seems more appropriate. I zested lime into the meat while it was cooking to give it extra lime flavor. Instead of toasted rice, I took the easy route and used La Choy crispy rice noodles. Also, I did serve this over a cabbage, lettuce and cucumber salad and topped with peanut satay sauce. I’m going to make it again, but I’m following your recipe for the meat. I use soy sauce and chicken stock powder- I love it as I can’t handle the smell of fish sauce any more. I just bought a larb moo from my favourite larb/ som tum/ sup nomai place in Bangkok – in a little night market near Lumpini Park. I watched the woman cook it. Just a tiny squirt of fish sauce, it would have been well under half a tablespoon. It should be spicy and a bit sour, not salty. I just ate it and, as usual, it was superb. Just one more thing though: I don’t know what you’re making there but it is nothing like larb gai. Same here. I dont know what that is either. Add fish sauce after the meat is cooked and the fire is off. The fish sauce would taste better than the soy sauce. I get chicken larb at a Vietnamese place here in Anchorage, Alaska–nowhere else in town makes it as good as they do. I became addicted and figured I better start making it for myself at home before I go broke eating it 3 times a week. I found this recipe, made the khao khua that night and the recipe the next day, and it is almost *exactly* like they make it at my favorite spot—it is soooooo good! Gobble gobble gobble gobble! :-D I also made some for my traditional dance group using our wild silver salmon for the meat, and they loved it! Thank you for posting this recipe! Gobble gobble gobble gobble! :-D Love this site! this took me a little time to make but it was well worth it! very awesome recipe! thanks! Thank you Phyllis, glad you enjoyed it! I’m not in a position to cook it (cos I’m in a hotel) but I can vouch for the fact that it’s very authentic. The ingredients are spot on and the quantities look very close to the one I just ordered and watched being made here in Bangkok. 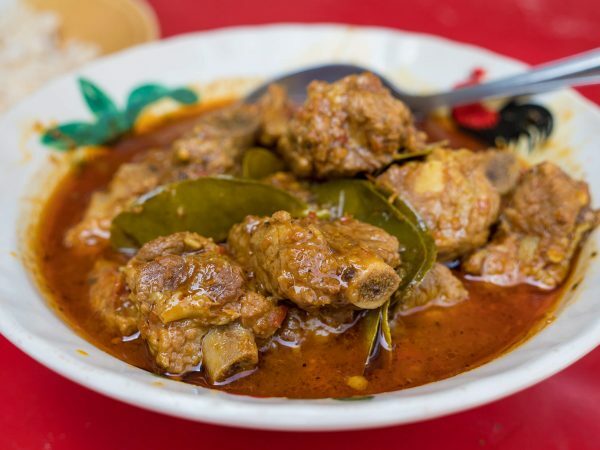 There are plenty of small variations – some Lao people will add pieces of tripe (though more common in larb neua), usually there is no coriander and often there is less mint and green onions than in this recipe, and obviously the amount of chilli varies a lot – but this recipe does look very traditionally accurate. Oh that’s what it’s missing (to be the same as my grandma’s)… tripe!! 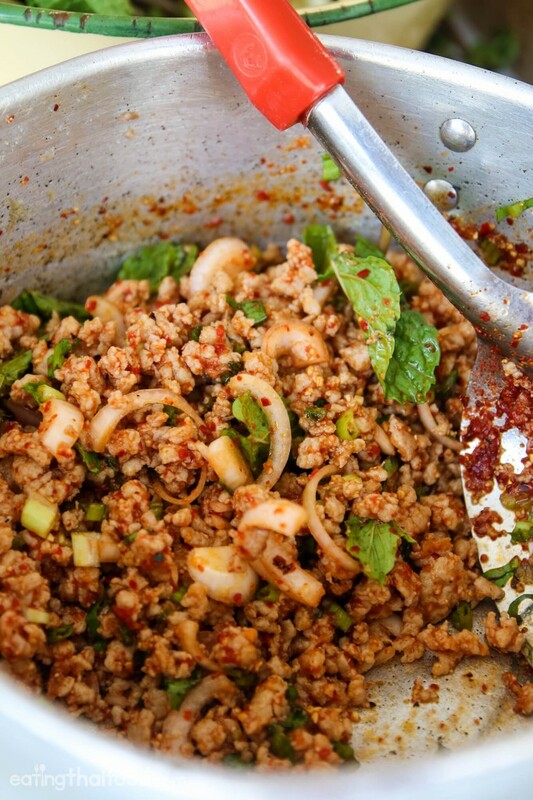 We love larb moo…I replaced the fish sauce with soy sauce(allergic) and fresh chilis…great! What a great idea to replace the fish sauce with soy sauce. I might try that next time. Perfect recipe! We are recovering from various winter ailments in our house, and this is such a healthy, healing, and easy to make meal. So excited to make it again with chicken and then beef. Hey Jessica, thank you very much, glad you enjoyed it! Hey Michelle, so happy you found this recipe and that you enjoy eating larb. Enjoy! Wow this is a yummy dish. I add some lemongrass and fresh Thai chilies into my dish and it was perfect. Awesome to hear that, thanks Mai! So the rice stays uncooked only fried and then grounded fine? Hi Bernadetta, yes, the rice is powdered form and just provides a slight crunch to the dish. Good instruction on recipe. Wish there was non-glutinous recipe. Thank you Stephen, glad you enjoyed it! Glutin in rice is not the same as gluten in wheat. (Note the difference in spelling.) All Rice is a gluten free food. Glutin with an “i” indicates a sticky texture. Gluten with an “e” can be a digestively offending protein found in (all and only) bread grains which includes wheat, spelt, kamut, farro, barley, rye, triticale, etc. , and anything derived from such grains such as couscous, bulgar, etc.—and then after further processing you get bread, pasta, flour, etc. Gluten can be hidden in packaged products. READ the label. Many companies now indicate on the label if it is gluten free. Oats do not have gluten. Oats can get cross contaminated with gluten because farmers rotate their crops with gluten grains, usually wheat. If you are severely sensitive you can pay extra for certified gluten free oats. Buckwheat is gluten free. It is a grass. Other gluten free grains are quinoa, amaranth, wild rice, corn, millet, etc. Additionally the gluten issue many people have in America may be due, in part, to GMOs. Wheat, corn, soy are predominantly grown using these practices. Avoid GMOs by eating organic when possible! Stunning! Will be cooking this recipe too. On a recent holiday to Thailand I found Larb Moo Tod on a menu at a restaurant we visited. The small deep fried patties were a great variation of Larb Moo. Have you seen this on your travels through the Kingdom. Hi Peter, great to hear from you. Yes, I’ve had it quite a few times, it’s a nice variation. Thanks for sharing! I found this this recipe easy to execute but extremely lacking in flavor, tastes mostly like what you expect cooked pork to taste like. Served it but had to quickly look for a fix as it was not well received. Found a different recipe that called for 3 tablespoons of fish sauce to 1 lb of pork in addition to more sugar and limj. Made up the difference in the “sauce” in a separate bowl and added it to what was originally made. Rave reviews after that! Hey Binh, thanks for the feedback. Perhaps it just all depends on the sourness or your limes and flavors of your ingredients. That’s one reason why Thai recipes can’t fully be followed, but rather you need to rely on taste testing and adding. Glad it worked in the end! I ordered Laab at a local Thai restaurant that I love. It sounded good on the menu. Why did it smell like feces? It was an utterly repulsive odor. Too much fish sauce?? I have been trying any Thai restaurant I can find since I moved to Chicago and they all fail pathetically…. I am spoiled by the ones in Florida and Las Vegas. I have decided to stop wasting my money on those places and make my own. Your recipes are sooo authentic. I absolutely love the fact that you are here and I found you!!! Thank you for my healing food and my comfort food finally again. Love your recipes and Laarb is a favorite. Great to make it myself! Thanks for sharing your knowledge! nice straightforward recipe. using lettuce delivery system for larb and rice. thank you! As a child and all the way to adulthood, we would go to the market, (near Bang Saen), buy a piece of whole fatty pork to take home. Then, we’d wash the meat (raw meat hanging outside, with flies back then.) Once the meat had been washed, thin slice it. Place on our thick wooden cutting board, get out 2 very large chef knives, and we chopped the meat. We chopped & chopped, turning & mixing meat pieces at the same time. After about 30 hours (seemed that long to me when I was young), the meat was pronounced perfect. Then, and only then, did we begin to make Laab Moo (or Laab Neua). It was work, but worth every second. When I came to the US, they had ground pork, but it was too ground up for the dish. It’s only in the last 10 or so years that I have been able to buy pork that is the proper texture. I still make most of my ingredients & foods from scratch. In fact, tonight is the very first time in 59 years, that I am going to use store bought red curry paste! Mae Ploy brand, of course. I have my ingredients though, just in case it’s not as good as made from scratch curry paste. Laab Moo (Neua), Som Tham, & Sticky Rice. Snack foods from heaven & great movie watching foods! Very happy with your larb, som tam and mango with sticky rice recipes. Everything turned out really well thanks to your very easy to follow instructions and videos. Thanks! Hey Karlijn, great to hear that, glad they turned out well! Hi Mark. Thank you for all your amazing recipes. We have lived in pattaya for over a year, and love Thai food, but didn’t realise it was so easy to make our favourite dishes. 30 minutes on your site, and we were inspired to cook laab moo and gra pow. Both of them were successful and we now love cooking Thai food. Thank you for opening up this new hobby for us. Hi Kaz, this is awesome to hear, glad you’re able to cook some Thai dishes the way you remember them in Thailand. Keep enjoying Thai food! I want to cook this recipe with duck, so do I have to do it any differently. I mean do i have to marinate the duck or something. Hey Puja, I think it would be pretty much the same, just mince it up and cook it the same. Hope you enjoy! Tried this tonight with freshly ground chicken breast. Although I am not a fan of mint, I still added it and was pleasantly surprised how all the flavors worked together. My family really enjoyed it. Thank you! Great to hear that, glad you enjoyed it! Hey Paul, thank you very much, hope it turns out well. For green papaya, you could use cucumber or green mango. Enjoy! You can try to use Kohlrabi as well. Love you’re recipes mark! You’re always so enthusiastic about thai food! ! Thank you very much Kieran, appreciate your support. After months of wanting to make this stuff I finally decided it was time. thx for this recipe it was amazing. will definitely be adding it to my go-to recipes! Hey M, great to hear you enjoyed it! I made this tonight using ground turkey instead of pork. It was so easy to make and delicious! Hey Alexandra, awesome to hear that, glad you enjoyed it! 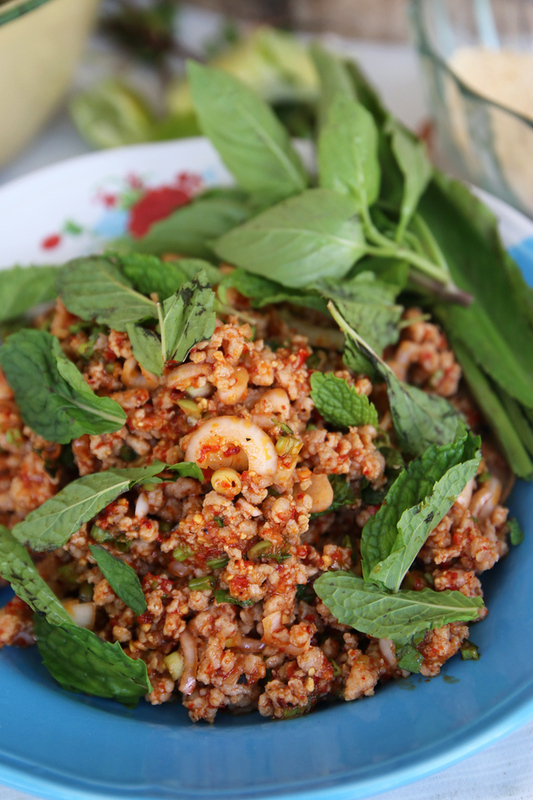 Its the most delicious and easiest larb gai recipe .. Mark you are the best!!!!!! Thanx a million for sharing this awesome recipe with us, it has become a staple dish in our house!! Great to hear you enjoyed it Ruby, thank you very much! Hey Ruby, so great to hear you enjoyed this recipe and the pad kra pao as well. Glad you had a fun and delicious trip to Chiang Mai as well! I make it very thai style chilli strong. It is very easy to do…. Great to hear that Mattias! 30 years ago, I walked into a tiny Asian restaurant that had 150 items on the menu, and I had all of them over the course of the years we lived nearby. Larb was a favorite, along with the green mango salad. Oh, my. We ate dinner there 2-3 times a week, although it was 12 miles away. We became friends over the years. Sweet memories you kindled with this recipe. I’ve never had another as good as theirs. Hey Jane, thank you for sharing, that’s an amazing story! Can you substitute roasted rice powder for the toasted sticky rice? It’s an item I can easily buy in the grocery stores here in Los Angeles. I don’t think it adds any texture, though. Hey Xochitl, hmmm, is it fine like flour? I’m thinking that if it’s already ground, it’s probably too fine – and this should be quite coarse so it has that texture. But you can make it with regular rice as well, just try fry it until it turns golden, then crush it or blend it quickly. Enjoy! Made this the other night with pork that we had leftover from a carnitas recipe from Diana Kennedy – and was lazy and used the roasted rice powered. But we devoured it! Will make again, from scratch hopefully! That sounds delicious, haha, good idea! Thanks for this great recipe! Made it last night and it tasted awesome. Toasted rice was a MUST HAVE and so worth the effort. Hey Alice, great to hear you enjoyed it. I agree about the toasted rice, makes all the difference. Mark, you are awesome! Started watching your youtube videos a few months ago but haven’t checked out your websites, until I stumbled upon this recipe. Thank you for all you do! Thank you very much Mai, really appreciate your support. Thank you for watching and reading! Love the recipe…I live in Italy right now, and cilantro is difficult to find. I did find a couple of Asian groceries that occasionally have it. Having live in Miami before, I strongly prefer culantro, but that is impossible to find here. I got my hands on some seeds…about 10,000 of them (or two tablespoons LOL) but have had no luck getting them to germinate. Any tips on growing culantro??? Hey Len, good to hear from you, glad you like this recipe and dish. Hmm, I’ve never tried to grow culantro before, so sorry I don’t have any tips myself. Maybe someone else here can help us? Re cilantro (green dhunia / green coriander) … Many merchants of coriander seed sell it as a whole spice, not intending you to grow your own. To stop germination (or possibly to enhance the toasted flavor of the coriander seed) it is roasted before sale. Result: no germination – the seed is dead. You need to buy coriander seeds from a seed merchant, not coriander spice from a spice merchant. Buy the right seeds, and coriander / cilantro grows like a weed. Hey Steve, great, thank you for the extra information. Love your website. My husband and I we’re fan of Thai food and been wanting to learn this recipe but it seems too much work until I saw your video. Thank you for sharing Mark! God bless you and more power to you! 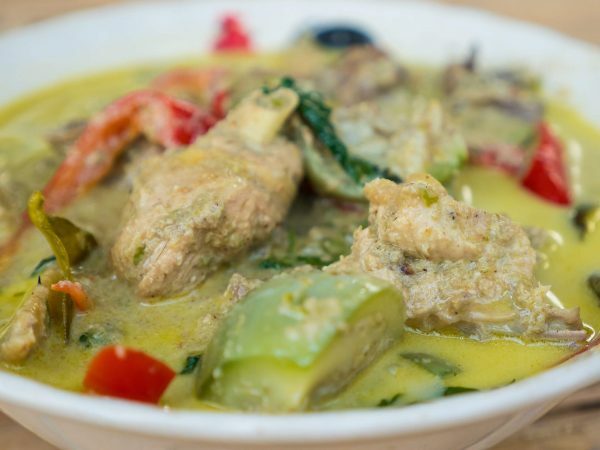 Hi Zarah, great to hear from you, glad you and your husband love to cook Thai food too. This recipes is pretty simple to make, let me know how it goes. Hi Mark, just back from a month in Thailand with my family. My wife and I taught for two years at Bangkok Christian College from 2002-04, and it was our first time back since returning to Canada. When we came home after our teaching stint, I was passionate about cooking Thai food, but my conviction faded over time. However, our recent trip rekindled my enthusiasm. My wife and I have also resolved to make healthier dietary choices, and that involves removing much of the flour, rice, potato and sugar that we used to eat. Thai cooking actually makes this really easy, with a few small modifications. One modification that works beautifully is to substitute lightly toasted white sesame seeds for the toasted sticky rice in Larb. Can’t wait to try it with your recipe. Also going to try substituting stevia for sugar. Really glad I found your site, and keep up the great work. Hey Adam, great to hear from you, so glad you you’ve spent time in Thailand, and that you enjoy cooking Thai food. Good idea for the healthier choices, the toasted sesame seeds I think will taste great. Also, when I’m cooking this for myself I usually don’t add the sugar, but I included it in this recipe as that’s the way it’s often prepared in Thailand. Let me know how it goes! I was a bit skeptical about this recipe because I found it too easy, but still decided to give it a try tonight, and omg, it was delicous!!! I added way more fish sauce, lime juice, fresh chilies and khao kua, according to our tastes only. My husband was so happy that I finally made him some laab. Thanx so much for sharing this recipe! Sounds fantastic Jane, glad you and your husband enjoyed it. Laab really is an easy dish to make – and it’s just all about taste-testing until you have the flavors perfect. Glad you liked it! Another great recipe. Thank you for making all this so accessible. My thing was Laos where I had a business in Luang Prabang for eight years and while the food was always a major incentive to travel back there as often as I could, I never got round to really mastering the art or even begin to. Your web site is a welcome treat to the un-initiated or those too shy to take the plunge. Hello Olly, great to hear from you, thank you very much for the kind words. Glad you enjoyed your time in Laos, and especially the food. Yah, definitely give some of these dishes a try, they’re not too hard to make, and you can balance out the flavors by taste-testing. Let me know how it goes with the cooking, and have fun! Just a couple suggestions from someone who has been trying to perfect this for a while. I use fresh ground chili past and sweet chili sauce (both available at any asian market) rather than the chili flakes and brown sugar. Cook the protein in a little sesame oil, add the chili sauces and lime and cook complete. Let it sit for at least 15 minutes to cool, or it will completely cook the add-ins, making them soggy instead of fresh and crisp. Toasted rice made in a food processor will be pretty fine, and works well to thicken the mixture, but hand ground toasted rice using a mortar in pestle will give you the crunch..just break the rice into quarter grain chunks, then use them both.. I kinda disagree about the Cilantro not being I’m portent..I use a full cup in a pound recipe, finely chopped. Thats Chaing Mai style..
Hey John, great, thank you for your tips, sounds delicious. I like your idea about waiting until the meat cools so the heat doesn’t cook the herbs. Thanks again. Do you cook other northern Thai dishes as well? To each his own…It’s pretty good no matter how you make it. The garlic, fish sauce and lime juice though are crucial. The cilantro really sets it off when you get it just right. As for anybody traveling to Thailand, take a stock of Imodium with you. Those spicy dishes will keep you in the toilet quite a bit. I’ve ordered my food “Mai Phet” (not spicy) MANY, MANY times at restaurants there and they pay zero attention…More likely “A Little Bit Spicy” to them is still enough to explode your head. Hey Ken, thanks for sharing your tips! Hi Mark! I’ve been following you on your youtube videos and now your recipe blogs.. Wanted to let you know that you make me drool in every video!!! 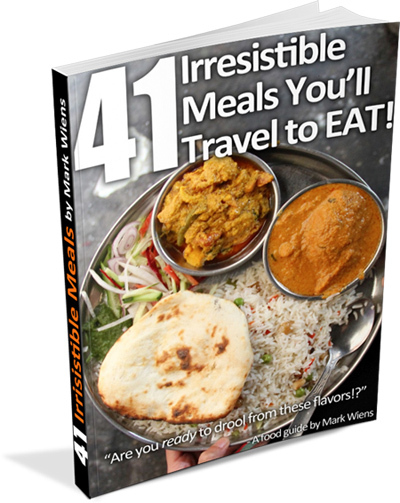 I am planning a trip to Thailand next year and will use your guide to getting good food. Hi Jennifer, thank you very much for the encouraging words, and for watching my videos. Glad that you’ll be coming to Thailand soon! Let me know if I can help you with any planning. Good idea for adding extra chili and garlic, that’s always a good thing! Love your video in cooking thaifood ,you make it easy to follow. I’m going to try making the larb.my family and I we love thaifood,a couple years ago we visited Thailand,we had a lot of fun and of course the food.we went to Bangkok and Phuket.too bad that here in America we can’t find an authentic thaifood. Hey Joan, thank you very much for watching and for reading. Hope you and your family enjoy the larb, let me know how it goes. Following your recipe I made this about a week ago. Since then I’ve made it twice more……. Making it again tonight…… I think that says it all ! Thanks for posting; can’t wait to try the Bangkok real-deal when I arrive for the first time ( armed with your guide ) next January. Hey Andy, thank you very much for the comment, and so glad to hear you enjoyed this recipe and dish. Hope you have a wonderful upcoming visit to Thailand. Let me know if you have any other food related questions. Made a version of this with chicken and shrimp for my wife on valentine’s. It was a huge hit. This recipe is so simple and quick. Awesome, thank you for sharing Paul, glad you had a great valentines and with larb!! My husband recently bought bangkok cookies larb. Can you please tell me what meat they have used to season the cookies. Hello Meena. Hmm, I’ve never heard of cookies larb… where did you buy them? 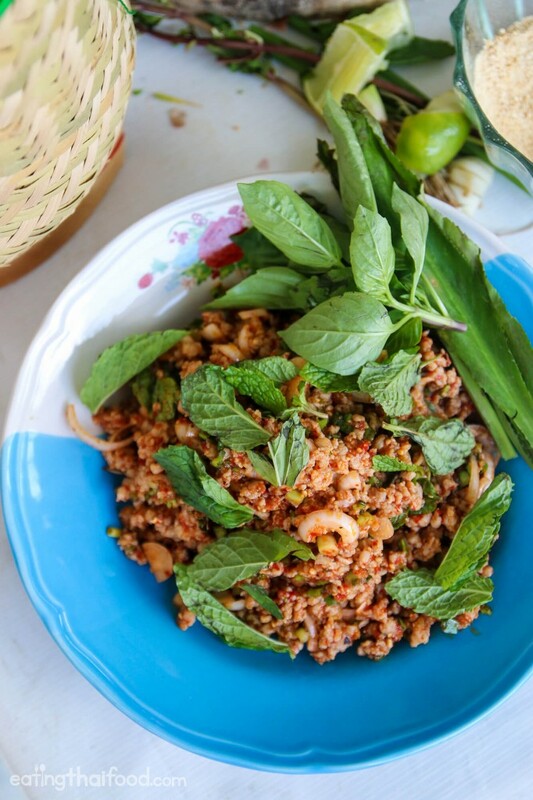 If it tasted like larb, they may have seasoned them with chilies, lime juice, mint, and roasted sticky rice. I personally love Larb in every single variation. I could eat it every day. This recipe is a all time classic. What I also like is when they put some Padaek into the Larb. You’re welcome, and thank you for checking it out, glad you love larb too!